Anton Rea Cutajar, the owner of an illegal zoo in which big cats are bred for a lucrative market, has just rung me to take issue with the fact that I wrote about his illegal operation earlier this afternoon. I explained that this is not personal and that news reporting and commentary is not the business of doing harm to those who are reported on or written about, but the business of keeping the public informed. Why can’t I go to my friend Keith Seychell’s party, he said, and why did you publish that photo? What business is it of yours or anybody else’s? You’re right – it wouldn’t have been any of our business if two members of the cabinet, including the Environment Minister, and the former director of operations at the VAT Department, now installed at the Inland Revenue, were not also in the picture with you and your host. But they are. That makes it very much a public-interest matter, especially on the eve of the Planning Authority vote on your illegal zoo. I do a lot of charity, Mr Cutajar said. Do you know how much charity I do? No doubt, I said, but then so does the Mafia. Are you comparing me to the Mafia? I’m not the Mafia, he said. I never said that you are, I replied, but I’m pointing out that crime, flouting the law and acts of charity are not mutually exclusive, that charity is a separate issue and that acts of charity do not justify or excuse building a full-on zoo without planning permission and operating it in defiance of the law. I am a very big millionaire, he said. Do you have any idea how much money I have? I don’t need to justify myself with anyone. That’s exactly the problem, I said. You think that because you have lots of money you can do what you please, that you are more equal than others before the law, and unfortunately, you’re being proved right on that. You’ve been expanding your illegal zoo for years while flaunting your relationship with the Prime Minister and other government politicians, and communicating the message that so what if you’re breaking the law in a big way, you’re a rich man and you’re mates with the Prime Minister. Why can’t I have a zoo if I want to, he said. Nobody’s saying you can’t have a zoo if you want to, I said – not even the Planning Authority, which has just told you that you can keep your zoo. I’m telling you something else: that the thing to do is first get a planning permit and then build your zoo, and not the other way round. That’s how it works for lesser mortals who aren’t rich men who are mates with the Prime Minister and his wife. If we went round setting up illegal zoos we would have the police on our case in no time. Have you ever been to my place, he asked rhetorically. No, I said, and I don’t wish to, so please don’t invite me. Don’t you like animals, he said. Of course I do, I said, and I also hate cages of any kind, type or size. People who love animals know they should be in their natural habitat, not under great stress in a small cage being gawked at by crowds. Animals belong in nature, not in your cages. And that was the end of the conversation, which was reasonably civilised despite everything. 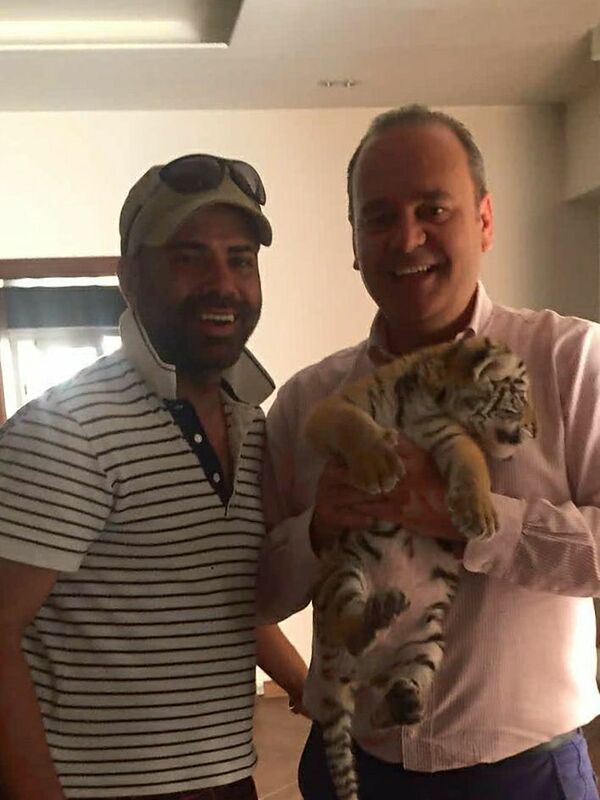 Anton Rea Cutajar with the Minister for the Economy and one of the tiger cubs which Mr Cutajar has bred in captivity for a lucrative market.